Some of the following background information is from my recollection of the events as I grew up on Federal Point between 1939 and 1956, and what my father, Howard Curtis Hewett Sr, and my grandmother, Addie Jane Lewis Hewett, related to me. Other background information is from research and is so noted. A major portion of our seafood came out of the bays south of where we lived in Fort Fisher. But first, it is important to understand how those bays were formed. A major Atlantic storm in 1761 opened an inlet that crossed the peninsula south of the current Fort Fisher monument. The New Inlet had a major impact on the main channel or ‘Bald Head’ channel of the Cape Fear River resulting in the significant decrease in depth. By 1839, sand, silt and forming shoals from the New Inlet threatened the southerly approach to the river from the Bald Head channel. There were concerns that the Bald Head channel would not be available to shipping coming into the river from the southerly approach. The alternate route would force shipping to go out around ‘Frying Pan Shoals’ and enter the river through the New Inlet. This added to their passage time into Wilmington. Northerly shipping traffic could enter the New Inlet, which avoided the treacherous Frying Pan Shoals located 29 southeast of Smith Island. In 1870 funds were appropriated to close the New Inlet and other breaches that occurred as a result of storms and gales. The land mass was a narrow strip of sandy beach with very low swampland on the river side. The map above is an excellent representation of the topography of Federal Point in 1864. By observing the map, one can see what a formidable task the closing of the New Inlet and breaches were. In 1871, another storm further deepened the New Inlet. Actual construction work to close the New Inlet took place from 1870 to 1891. The U.S. Army Corps of Engineers were the overseers of the rock dam project. They sank wooden cribbing and then added stones to bring the dam to sea level. Asst. Engineer Henry Bacon suggested that they add heavy granite capstones to bring the structure to two feet above sea level. 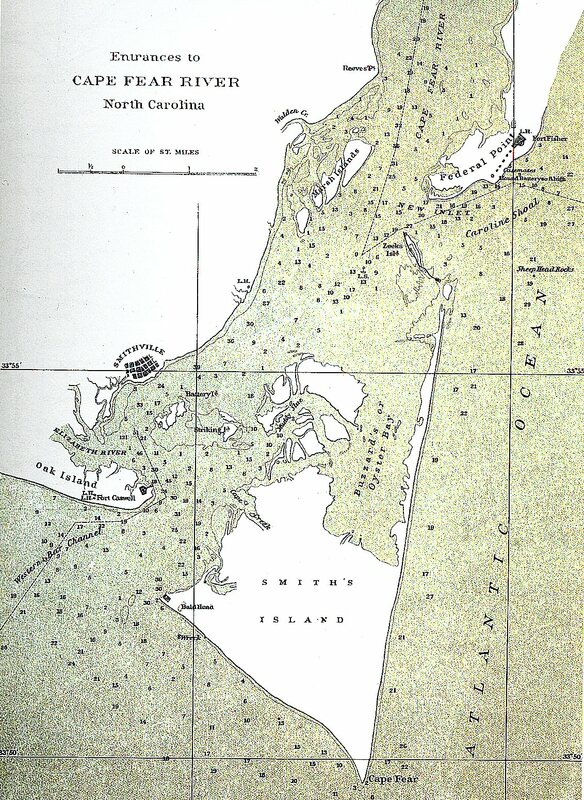 In 1877, a storm opened a breach between Smith Island, commonly called ‘Bald Head’ and Zeke’s Island which Civil War Military Maps recorded as ‘Zeeks Island’ (see the map right). From 1881-1891, a dam similar in construction to the one built between Buchanan Battery to Zeke’s Island dam was built from Zeke’s Island to Smith Island. When all the construction was completed, the upper section from the Buchanan Battery to Zeke’s Island was approximately 5,300 feet. The Swash Defense Dam from Zeke’s Island to Smith’s Island was 12,800 feet. The total distance of the project was over three miles (Reaves, 2011). In 1891, the New Inlet was declared officially closed (Jackson, 1995). This rock dam is known by the locals as “The Rocks.” With the closing, tidal basins formed between The Rocks and the Atlantic. For our family, these bays became a plentiful source of shellfish. During the time that I was growing up on Federal Point, there was the existence of another inlet south of the original New Inlet. We called it “Corncake Inlet.” I do not know exactly when Corncake Inlet opened, but it was a much smaller inlet. I do recall that Corncake Inlet would be wider and deeper depending on storm activity. Corncake Inlet was the source for fresh seawater for the bays. My best recollection from stories told by my dad is that a schooner carrying corn went aground on a shoal while entering the inlet and remained there for a several days. These schooners were called corn-crackers because of their cargoes. I always wondered if that is how the inlet received its name. I assume it was opened before The Rocks were completed, but these breaches opened and closed depending on storm activity. 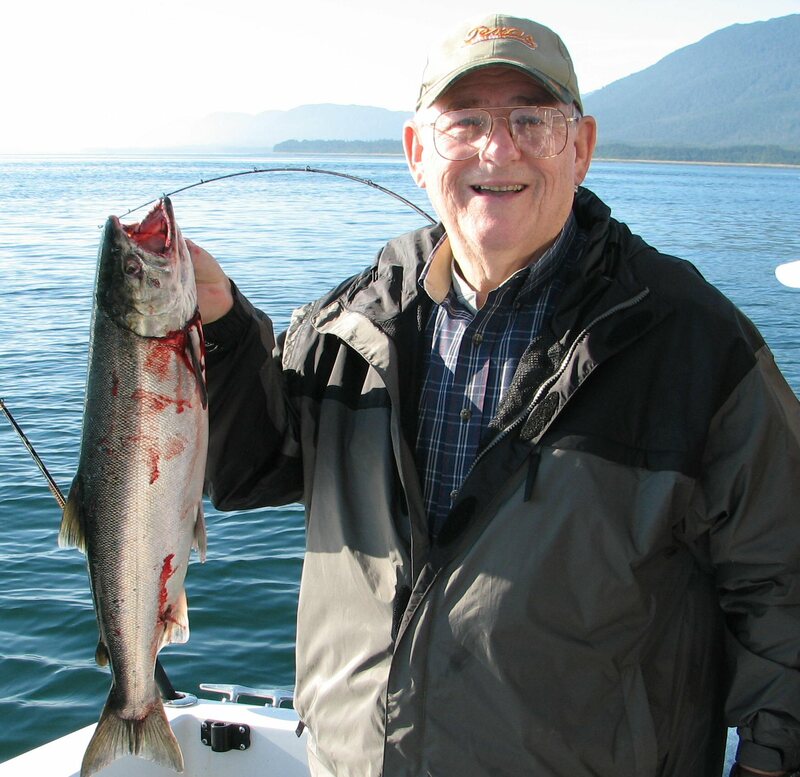 Dad liked to take our boat up toward the Corncake Inlet to fish for sheepshead at a place that he referred to as the “cribbing.” As I can best remember, it was east of the rock dam, basically located in the direction of Corncake Inlet. I believe that the cribbing was the remains of a temporary cofferdam that controlled some of the water flowing through the inlet into the river during the rock dam construction. I based this on the heavy flow of water traveling through this cut when we were fishing at this location. However, after completing some research, I discovered another possibility. The cribbing may have been the remains of a stone dike cribbing built in 1853 by Captain Daniel P. Woodbury (Rayburn, 1984). What I recall seeing was mainly a wooden structure at water level. There could have been stones under the water.